Photograph of a street in Hyderabad looking towards the Char Minar, taken by Deen Dayal in the 1880s. 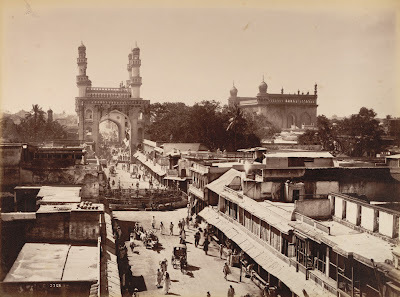 This is from the Curzon Collection: 'Views of HH the Nizam's Dominions, Hyderabad, Deccan, 1892'. Hyderabad was founded beside the River Musi in 1591 by Muhammad Quli Qutb Shah (r.1580-1612) as an alternative to his capital at Golconda.